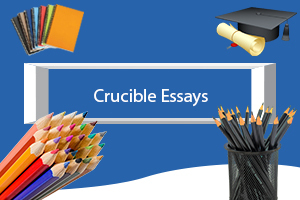 A crucible essay is an essay that draws on Arthur Miller’s play The Crucible. The Crucible is a 1950s play that used the context of the Salem Witch trials to highlight the hysteria surrounding Senator McCarthy’s communist hunts during the Red Scare. Essays about The Crucible may focus on content found within the play, but may also require the writer to go beyond the source material and investigate history to support his or her points. Crucible is a play by Arthur Miller with layers of meaning and subtext. Miller's mission was to draw a direct analogy between the social and political themes of the 20th century with those of pre-Revolutionary America. Setting the play in Puritan New England, in the town of Salem, allows the playwright to explore the thematic connections between the witch trials and McCarthyism. Doing so seems seamless, as the audience perceives three main themes that remain salient in American culture. Those three themes include that of social conformity; sexual repression; and religious rigidity. Miller explores social conformity, sexual repression, and religious rigidity throughout The Crucible, to warn of the cyclical nature of history and the resistance to change that permeates American society. Most of the American public did not know what communism or Marxism really was as an ideology, they simply knew that it was 'bad' and it was 'un-American,' although logically it could be argued that nothing is more un-American than prosecuting a person for holding certain political beliefs. The tragedies of Miller's "The Crucible" and the McCarthy hearings are that good men and women, as well as fearful and ignorant people were silenced by the witch hunts. People who defended the accused were called witches themselves. This can be seen when Proctor and Mary Warren are both, at different times and for different reasons called witches. When they defy Abigail's desires, their nonconformity makes them vulnerable to being accused. Witchcraft and communism are shadowy forces in the public imagination because neither is fully understood. to such proceedings, I am moved by the remarkable errant authority. is clear that everybody is on trial. Act IV: I am most surprised by the reversal of Hale in this act. Miller, A. (1964) The Crucible: A Play in Four Acts. Penguin Books. While he resists coming completely clean and exposing his affair, he eventually tells the whole truth, but only after the town is in chaos. The climax of The Crucible occurs toward the end of the play when Mary accuses Proctor of being a witch and he is summarily arrested. Prior to this the action builds as several girls in the play get caught up in the witch hysteria. Proctor's arrest at the hands of his servant Mary marks the downfall of his pride and his reputation. Proctor eventually offers a full confession but he honorably refuses to falsely label anyone as a witch. Hale begins the play as the most idealistic character, but ends the play telling Proctor to lie under oath and confess to being a witch, after Proctor is accused by Abigail. Hale comes to see the judicial system as bankrupt. This shows how a corrupt system can corrupt even decent people. The system also uses Hale's idealism for its own ends, as pro-democracy, pro-American people were used in subservience of McCarthyism. Just as dangerous as idealists like Hale are weak people, looking for a sense of belonging. Mary Warren, Proctor's new servant, enjoys the sense of community she feels with the other girls, and fears breaking from their ranks. Fear, ignorance, personal grievances, and an inflexible political and judicial process result in the death of John Proctor, an innocent man, who dies because he refuses to admit to witchcraft and harm other people. Individuals who named names were cleared by the House Un-American Activities Committee (HUAC) while those who did not name names were often blacklisted and lost their livelihoods. Those who refused to turn others in were the true Americans, protecting freedom, just like John is the truest Christian of the play, even though he dies and does not profess a formal belief in the Christianity of the Puritans. Q3: Summarize Arthur Miller's experiences with HUAC and discuss the consequences of those experiences for Miller. himself wrote the screen play of the film which starred Daniel Day-Lewis and Winona yder in lead roles and was directed by Nicholas Hytner. The Crucible is a fictional retelling of events in American history surrounding the Salem witch trials in the year 1692. The film, as well as the play on which it is based, is however in no way an accurate description of history and takes considerable liberties with the actual events that took place during the trial. The film is set in the Puritan era in a small town (Salem) in colonial Massachusetts when twenty innocent men and women were accused of witchcraft and put to death and hundreds more suffered. Miller himself said, "The play is not reportage of any kind .... what I was doing was writing a fictional story about an important theme." Arthur Miller's play "The Crucible" is set in Salem, Massachusetts in the last part of the 17th century. The play itself is based on the Salem witch trials that took place during that time. People who lived during that time period were very religious, and also very superstitious. The play revolves around power, jealousy, and superstition, all of which were very common during the Salem witch trials and the years surrounding them. However, ebecca is convicted of witchcraft by the court, and Hale begins to see the hysteria at work in the community, and begins to feel he is responsible. He tells the judge, "I have this morning signed away the soul of ebecca Nurse, Your Honor. I'll not conceal it, my hand shakes yet as with a wound!" (Miller 92). He begins to see how his own actions helped create more hysteria and confusion, and he questions his faith and his conviction that the Devil exists. QUESTION #3: Select another character in the film. I select Abigail, an orphan, one of the accused, who was only doing the provocative things a youthful person would do. She is thrown to the wolves and accused by many of the villagers; yes, she has weaknesses, but she is really only a pawn in the game that is being played. She has passion for a man who once loved her, and who can blame her for that? She is a scapegoat, but she also is an accuser, and so her frailty and lack of backbone actually become endearing qualities, compared with the hate and rage. She is like the innocent teen who gets in with the wrong crowd, but she can't extract herself from the terrible situation she has found herself in. QUESTION #4: Contemporary issues that are like a witch-hunt. In political campaigns, such as were witnessed in America in 2004, those candidates who did not support the executive branch's administering of the "war on terrorism" had their patriotism challenged. Former Senator Tom Daschle was hounded by attack ads that questioned his patriotism; Daschle had questioned some of the spending and the strategies of the Bush Administration, and the Republican Party spend millions on attack ads in his home state when he was running for re-election. He was defeated, a victim of a different kind of witch-hunt. A hunt for those who aren't patriotic enough to support the president no matter what. QUESTION #5: My reaction: The beginning of the film when the girls are doing their dancing in the forest, deviates very dramatically from the original play, and was apparently designed for filmgoers who did not see the original play. The way the movie portrays the girls, as silly frivolous teens sneaking out of the house to play pseudo-wicked games, in a way takes the gloss off of Arthur Miller's play. Movies have a perfect right to deviate from the original books or plays they were derived from, but in this case it seems the film has taken liberties with the story that stretch credulity. But there is so much chaos, and so many people charge each other in search for a scapegoat. Judge Danforth's court is simply not believable, since his court is interrupted so many times and drifts from one scene to another, from one new charge to another. It is as if he needs to find victims, needs to identify guilty members of the community - even if there are none - in order to keep his job with the government. However, the storytelling itself seemed to take a backseat to the drama, and it made the film drag in spots. Hytner, N. (1996). The crucible. [Motion Picture.] United States: 20th Century Fox. Off with their heads! Burn them up! e need to cleanse our community of good people from the malevolent designs of the wicked! Yes, people! e are at a critical point in the history of our great nation -- and our very existence is threatened by the Godless in our midst! e must, and we will root out the evil doers by any means necessary...and when I say any means necessary, I call upon the good citizens of this land to be vigilant -- to keep their eyes on anyone who might seem suspicious, for they hide amongst us, friends and neighbors -- yes they do. Schrecker, Ellen. Communism and National Security: The Menace Emerges. Boston, St. Martin's Press, 1994. Miller, Arthur. The Crucible. New York, Penguin. 2003. Johansson, Tobias. "The Crucible and the Reasons for the Salem Witch Hunt." Department of Language and Culture. Lulea University of Technology, 2004. Web. 09 July 2018. .
Lai, Chloe. "The Influential Role of Religion in 'The Crucible'." Prezi. Prezi Inc., 16 June 2013. Web. 09 July 2018. .
Miller, Arthur. The Crucible. Jordan Hill, Oxford: Heinemann Educational, 1992. Print. Norman, Destan. "The Crucible: Religion." Prezi. Prezi Inc., 15 Feb. 2016. Web. 09 July 2018. . The fear of communism ran rampant amongst the United States during the late 1940s to 1950s; throughout the nation, the fear of communist spies infiltrating the country caused the Second Red Scare, which was spearheaded by Republican Senator Joseph McCarthy. This phenomenon became so well-publicized that its story has been immortalized in film and literature. Such is the case in Arthur Miller's 1952 play The Crucible and Irwin Winkler's 1991 film Guilty by Suspicion. In both McCarthyism-inspired stories, there is a degree of similarities within their thematic showcases of intolerance, hysteria, and reputation. The playwright, Arthur Miller, was born on October 17, 1915 (Hinman et al., 1994). While studying journalism at the University of Michigan he began to write plays and win awards. With a strong interest in the plight of common man, it was inevitable that Miller, writing plays with a current of leftist ideology flowing through them, would capture the attention of the House Un-American Activities Committee (HUAC). Subpoenaed to appear before HUAC, Miller refused to name names. Fortunately for Miller and American literature, the theatre scene in New York City was relatively immune to efforts to persecute leftists. Cunningham, Lawrence S. And Reich, John J. (2010). Culture and Values: A Survey of the Humanities. Volume I. Seventh Ed. Boston, MA: Wadsworth Cengage Learning. Hinman, Sheryl, Cobb, Michele Lee, Hopper, Julie, Wafer, Shay, Wolf, Laura et al. (1994). Alive & Aloud: Radio Plays for the Classroom. The Crucible by Arthur Miller. LA Theatre Works. Retrieved 14 Jan. 2013 from http://www.latw.org/acrobat/crucible.pdf. Miller, Arthur. (1952). The Crucible: A Play in Four Acts. New York, NY: Penguin Books. In the book The Family Crucible, family therapists Carl Whitaker and Gus Napier (1978) team up to help a family with dangerous levels of discontent and animosity towards one another. At the center of the rift are the adolescent daughter Claudia and the mother Carolyn. At the periphery are the 6-year-old daughter Laura, an 11-year-old son Don, and the father David. On the surface, it is Claudia's behavior problems that are blamed by both parents for the family's woes. However, during the first meeting with the entire family present, it quickly becomes clear that problems with the marriage may be to blame. This essay will examine the parenting dynamics uncovered by Whitaker and Napier during their family therapy sessions, including the parenting styles used and attachment matrix that exist in the Brice family. Liddle, Howard A. And Schwartz, Seth J. (2002). Attachment and family therapy: Clinical utility of adolescent-family attachment research. Family Process, 41(3), 455-476. Moretti, Marlene M. And Peled, Maya. (2004). Adolescent-parent attachment: Bonds that support health development. Peadiatric Child Health 9(8), 551-555. Napier, Augustus Y. And Whitaker, Carl A. (1978). The Family Crucible. New York, NY: Harper & Row. Secular laws, of course, are made by men of power. Usually, these laws are enacted under the perception of the public good, or at least what those in power perceive as a way to retain power and engender the status quo. When events and personalities challenge the status quo, however, secular laws may not be enough to silence them. In order to keep control, propaganda and paranoia are often used to "bring events under control." Oftentimes, when spouses begin to have difficulties with their marriage, they lose track of the impact that their arguments have on the children. They are so wrapped up in their day-to-day difficulties, that the rest of the family becomes secondary. In the Family Crucible by Napier and Whitaker, the daughter becomes so depressed that psychological help is required. It is then that the family as a whole has to determine how to rebuild itself, if possible. The book consists of the ongoing therapy of the "Brice" family, which consists of the parents (David and Carolyn), adolescent daughter (Claudia), six-year-old daughter (Laura), and 11-year-old son (Don). Leadership is a practice that is learnt from the experiences of the leaders. According to Bennis and Thomas (2002), a crucible is delineated as a changing experience through which a person ends up having a new sense of self and character. In particular, the capacity to mine knowledge from such challenging and difficult experiences is what differentiates and tells apart successful leaders from their counterparts (Bennis and Thomas, 2002). The purpose of this essay is to ascertain, define and justify a crucible experience that one can have in life and delineate how that experience can have an effect on the personal style of leadership, behaviors, outlooks and viewpoint and shed light on how it will impact one as a leader in the organization. Bennis, W. G., & Thomas, R. J. (2002). Crucibles of leadership. Harvard business review, 80(9). Markos, S., &Sridevi, M. S. (2010). Employee engagement: The key to improving performance. International Journal of Business and Management,5(12), 89. Thomas, R. J., & Cheese, P. (2005). Leadership: Experience is the best teacher. Strategy & Leadership, 33(3), 24-29. Napier & Whitaker's (1978) classic The Family Crucible is the benchmark book related to family therapy. The book is thorough, and divided into twenty chapters that cover the gamut of family therapy theory and especially practice. Napier & Whitaker (1978) are family systems theorists, and they openly divulge their appreciation for an approach to individual psychology that takes into account family systems. In other words, no individual can be understood or helped without paying attention to the family situation, its dynamics, and its role in identity formation and coping. The authors discuss dysfunctional family systems via a case study. By focusing on one case study, Napier & Whitaker (1978) show how family systems theory works, and what clients can expect from the process. Napier, A.Y. & Whitaker, C. (1978). The Family Crucible. New York: Houghton Mifflin.
" Rather than endlessly musing upon his father's death, like a drumbeat Thomas simply repeats that his father must not "go gentle into that good night." ith every tercet, the repeated lines take on a different nuance. Reading the poem is like hearing a favorite song sung in a different way, again and again -- every time, a different shade of meaning is brought forth in the refrain of the poem. It is all too easy for a free verse poem to say the same thing in different ways: Thomas uses the same words again and again to convey different shades of emotion: good men, wild men, grave men, all for different reasons, he states, have not borne the inevitability of death with meekness. Briggs, John. Fire in the Belly. Red Wheel 2000. "Poetic Form: Villanelle." Poets.org. Published by the Academy of American Poets. American-Cuban-Filipino War." OAH Magazine of History. Spring 1998. Shortly after being expelled from Harvard, William Hearst acquired his first newspaper, the San Francisco Examiner, from his father. In 1895, eight years later, Hearst purchased the New York Morning Journal and entered into a fierce competition for circulation dominance with Joseph Pulitzer, who owned the New York World newspaper. In order to make their stories more sensational and therefore increase readership and circulation numbers, both newspapers greatly exaggerated and distorted their reporting. At approximately this same time, Hearst began using color in a comics series called "The Yellow Kid." The yellow dye stained the pages, and the stain as well as the stain of fabricated journalism became known as "yellow journalism." Freidel, Frank. 1969. Spanish-American War. In World Book Encyclopedia. (Vol. 17, pp. 590-591). Chicago: by Field Enterprises Educational Corporation. 427). The limitations of the steppe people -- for example, the Mongols -- was running into geographical conditions that they were not used to. India was sheltered from invasion by the Tibetan barrier (until a way to go around it was found). These examples show how the lay of the land influences history. Mackinder, H.J. (1904). The Geographical Pivot of History. The Geographical Journal, 23(4), 421-437. The moral question of the play is whether Shylock and Antonio -- and by extension those who close ranks around Antonio -- are truly different. Antonio and his friends are just as capable of the same "evil" which Shylock attempts to perpetrate -- just as Christians were the original antagonists of the story, before the roles were reversed -- yet the protagonists are greater in having a solidified group identity. The solidification of that identity, however, would not have been possible without the "evil other." So, is the process of othering moral? Certainly not, answers Shakespeare, but highly useful. There is much to the assertion by Nachman Syrkin that the Jews have persisted in history because the performed a socio-economic function that other peoples did not want to do or could not do. In his 1898 "The Jewish Problem and the Socialist Jewish State, " Syrkin lays out these ideas. Regarding this, Syrkin argued that a classless society and national sovereignty were the only means of solving the Jewish question completely. He felt that this social revolution would be the key to the normalization of the Jewish condition. ith this in mind, he argued that the Jew must therefore join the proletariat as the only way to end class struggle and redistribute power justly. Since the bourgeoisie betrayed the principles of liberalism, then Jews must be the torchbearers of Socialism. Borochov, Ber. "The national question and the class struggle." 1997. In the Zionist idea. Edited by Arthur Hertzberg, 355-360. New York: Jewish Publication Society. Hertzberg, 120-139. New York: Jewish Publication Society. Simultaneously, he forces a man long upheld as honest in the highest Venetian circles into scheming and manipulations; these are roles which Iago takes on too readily, suggesting a certain familiarity, but it must be preserved that no earlier instance is ever presented to suggest that the notables of Venice were in any way wrong to uphold Iago as honest and true. In fact, those same notables are those that appealed to Othello on Iago's behalf in the question of the promotion. Allowing passion to rule what should be societal decisions is Othello's barbarism cracking through the veneer of his civility. Othello, though a great soldier, is no Caesar nor even a Roman at all. His nature is of the wild, and -- like many tamed, wild beasts -- he retains the inner potential to one day bite the hand that feeds him. 1. Shakespeare, William. "Othello the Moor of Venice." The Compact Bedford Introduction to Literature. Ed. Michael Meyer. 8th ed. Boston: Bedford / St. Martin's, 2009. Print. That irony is not lost on many of the high technology executives who at one time advocated disintermediating their entire dealer channel and taking their largest customers direct only to discover that trust is the greatest catalyst of efficient transactions of all (Smith, Manna, 2004, 377, 378). Veneta Andonova. 2003. ONLINE DISINTERMEDIATION: Differences in the Behavior of Traditional Retailers in Adopting E-Commerce. Management Research 1, no. 3, (October 1): 279-290. Bull, C.. 2010. Customer Relationship Management (CRM) system, intermediation and disintermediation: The case of INSG. International Journal of Information Management 30, no. 1, (February 1): 94. It is from this spiritual foundation that I wish to approach healthcare as a professional nurse. Healthcare is my duty, and I shall see to it that I "freely give" of my energy to heal the sick and communicate the word of God via my work. Do you think Nokia's strategy to enter the content area is more successful than the mobile operator Vodaphone's $38 billion attempt to enter the content area? Why or why not. Explain using information from the case or your own research. Economist.com, 2008. Business: Ovi go again; Nokia. (2008, December). The Economist, 389(8609), 84-8/5. Anssi Vanjoki. (2005, November). Nokia Shifts Focus to Music, Photos and TV. America's Network, 109(11), 28-29. Wireless News, 2007. Nokia Ramps Up with New Content Partners for Video Center. (2007, October). Wireless News,1. Berkouwer, G.C. "Human Freedom" from "Studies in Dogmatics," Man: The Image of God GrandRapids MI: Eerdmans 1962. Christianity and Judaism: The Deepening Dialogue. Ed. Richard W. Rousseau. Scranton, PA: Ridge Row Press, 1983. Cobb, John B. A Survey of Methods. Philadelphia, PA: Westminster Press, 1962.